What is Anglicanism? How is it different from other forms of Christianity, and how did it come to have so many different versions throughout the world? Although originally united by location and a common belief, Anglicanism has gradually lost its pre-eminence as the English state church due to increasing pluralisation and secularization. While there are distinctive themes and emphases that emerge from its early history and theology, there is little sense of unity in Anglicanism today. Here, Mark Chapman explores the fascinating history, theology, and structures of Anglicanism, and highlights the diversity of the contemporary church by examining how traditions vary from England and American, from South Africa to Malaysia. Chapman looks at current developments and controversies, such as homosexuality and women priests, and offers thought-provoking suggestions for the future of Anglicanism. Putting the history and development of the religion into context, Chapman reveals what it is that holds Anglicanism together despite the recent crises that threaten to tear it apart. Mark Chapman, a historian and historical theologian, is Vice-Principal of Ripon College, Oxford. 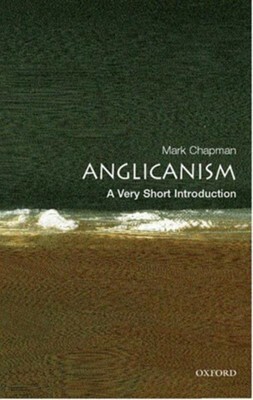 I'm the author/artist and I want to review Anglicanism: A Very Short Introduction.